Cervical cancer kills almost 900 women a year in Britain, and the proportion of women going for smear tests recommended by the NHS to detect the disease is at an all-time low. This is due to negative perceptions of the test, according to Jo’s Cervical Cancer Trust - the charity behind the campaign, which launched on Monday to mark the start of Cervical Cancer Prevention Week. It aims to reverse the trend in which the proportion of women attending cervical screening appointments has dropped to 71 per cent in England, with more than one in four women across the UK not turning up. The key messages are that smear tests aren’t always easy, but they can prevent cervical cancer and save lives. Women are being encouraged to find out more and get support to help overcome any concerns they have. The campaign is specifically targeting women aged between 25 and 35, as only one in two women in this age group show up for smear test appointments in some parts of the country. The campaign has been informed by new research released by the charity into the reasons why many women are not getting screened for the disease. Some 71 per cent say they are too scared and 81 per cent cite embarrassment, while more than two-thirds (67 per cent) say they would not feel in control. The findings, along with the use of case studies of women talking about smear tests, helped secure widespread national print, online and broadcast coverage of the campaign launch on Monday – including the front page of the Daily Mail. #SmearForSmear 2019 is here! 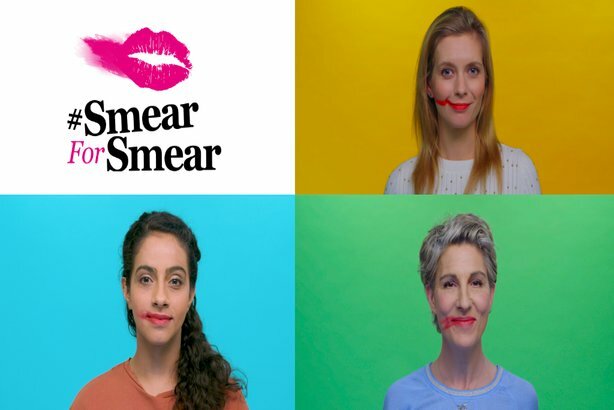 This Cervical Cancer Prevention Week join @rachelrileyrr, @mandipgill_, Nikki Amuka-Bird & Tamsin Greig by sharing your #SmearForSmear with a tip or word of encouragement to support women in booking their #SmearTest ???? Kate Sanger, head of comms and public affairs at Jo's Cervical Cancer Trust, told PRWeek: "In terms of media we’ve had several hundred pieces already; considering it’s quite a big Brexit week I’m pretty happy with how it’s going." She added that the campaign will be judged on "social media reach and engagement" as well as "media metrics". Sanger commented that anecdotal reports from doctors and nurses of increased attendance for smear tests "are also really important to us". The campaign is being promoted on social media under the #SmearForSmear hashtag, with the deliberate play on words aimed at encouraging people to share lipstick smeared selfies to boost awareness of the issue. In addition, a campaign film features TV presenter Rachel Riley, actors Mandip Gill, Nikki Amuka-Bird and Tamsin Greig, who address some of the main reasons why so many women are not going for smear tests. They reassure women that "nurses have seen it all before" and that "no question is too big, too small, too silly or too weird". The celebrities say the tests are "not always easy" but "they can prevent cervical cancer" and "you can say 'stop' anytime". They add: "you’re not the only one who feels this way." Smear tests aren’t easy for everyone, but they can prevent cervical cancer. Please watch and share @JoTrust ‘s #SmearForSmear film to share tips that may help women feel more in control and confident to book their test:https://t.co/5jXLhgiSje ????? ?